Now that the Big Three Solo Episode Experiment has concluded, let’s weigh in: Kevin’s episode was clearly the most effective use of the format. 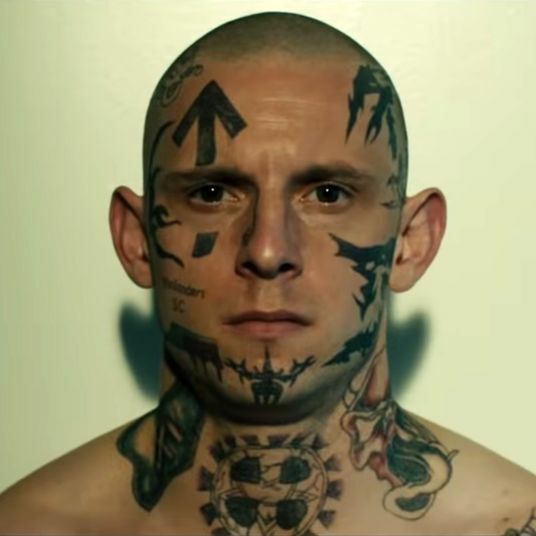 “Number One” added some much-needed depth to his character in an affecting way that would not have worked as well in a standard This Is Us episode. Even that little “previously on” clip of Kevin doubled over, weeping, rocked me to my core. Kate’s episode was fine, but the standout moments were the two conversations between the Kates and Rebecca and could’ve easily been woven into an episode in which we still get to see Randall and Beth do the damn thing. Speaking of Randall, we arrive at “Number Three.” This Randall-centric episode feels less like a pause to focus on a character in an ensemble, and more like a glimpse into a world where This Is Us is a show about a man named Randall Pearson, who we get to see at all stages of his life and sometimes his extended family visits. This is not a bad thing. This is a great thing. This is the show I sometimes pretend to watch when other story lines annoy me. 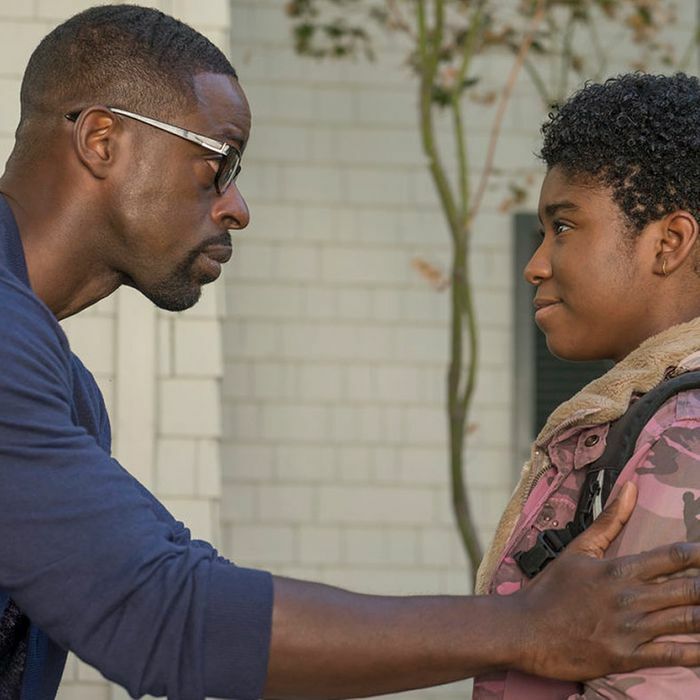 So, let’s jump into Randall’s world because when Sterling K. Brown brings his single tear along, you know it’s going to be a ride. Randall’s episode is mainly about saying good-bye to Deja. We all knew this was eventually coming, but that doesn’t make it any easier to lose a person who, in just a few episodes, feels like part of the family. Shauna’s charges have been dropped and she wants her daughter back. Like, now. She shows up at the Pearson’s door unannounced and refuses to leave without Deja. She gets up in Beth’s face. That beautiful face! Ultimately, Deja talks her mother down — they need to do this the right way and go through social worker Linda. Linda! Poor Linda, the unsung hero of this season. How many times does Linda have to sit there and listen to Randall tell her how she’s doing her job incorrectly? Sweet, sweet Linda. A lesser person would flip a table. Linda does not. Once again, she calmly allows Randall to tell her that Shauna is unfit to raise Deja (according to Linda, and most likely a judge, she’s not unfit) and that he and Beth are getting their lawyer involved. Linda strongly advises against it. It’s obvious this is because they’ve grown to care deeply about Deja. I mean, look at how excited Randall is to help Deja with her photosynthesis project. Or how he loves when Deja teases him about being corny and referring to himself as Foster Dad. He is proud of Deja’s hard work. He loves this kid. So, we get it. But also, cool it, Randall. Let Linda live! He eventually sees the error of his ways, mostly thanks to William. Thanksgiving is only a few days away, so the events of last year’s epic holiday are on Randall’s mind. You know, that time he found out his mother knew who his birth father was and lied to him his entire life, broke all of our hearts, etcetera, etcetera. In a scene that seemingly takes place after Randall’s psychedelic trip in the woods, he has some questions for his father. As it turns out, when Rebecca fled after feeling overwhelmed by William’s enthusiasm during her second visit, William followed Rebecca home and thought about knocking on the door. We see this version of life play out, with William around for Randall’s birthdays, Christmas, graduation — all the big stuff. But William stopped himself. He saw three bikes on the Pearson front lawn, each with a nickname license plate, and realized he didn’t know which one was Randall’s. William knew he couldn’t just insert himself into this whole other life Randall had against Rebecca’s wishes. Who was he to do so? After Randall does a drive-by of Shauna’s place, he comes to the same conclusion: Deja had “this whole world spinning” before Randall and Beth came along. He meets Beth at Deja’s school for her science presentation and tells her as much. Beth was having the same reservations. There’s also a weird rambling speech about Pac-Man and how time is a flat circle, maybe, and a very cute thing Randall does to show Beth how beautiful she is. (It has to do with rose-colored glasses and you should watch it if you need a good swoon.) Knowing they’ll be saying good-bye to their girl, Beth and Randall watch Deja’s presentation. And Randall’s face when Deja tells the whole class that her foster dad helped her with her project? Forget it. Puddles. If that moment doesn’t get you, Deja’s good-byes to Beth and Randall will. Beth tells Deja to take care of her thick, beautiful hair and her big, beautiful heart. And Deja and Randall have a Moment. He knows she doesn’t like to be touched by him, so he won’t hug her. But she says she doesn’t mind it when she knows it’s coming. You guys, this hug is the best hug. Then the Sterling K. Brown Single Tear™ makes its entrance and we return to our puddle forms. Teen Randall’s story line doesn’t exactly line up with Adult Randall’s as well as Kevin and Kate’s, but it is a good one nonetheless. Randall and Jack head out for the college road trip we’ve seen them leave for in “Number One” and “Number Two.” Randall is applying to Harvard, but he really wants to go to Howard University. It’s where Yvette’s son (and Randall’s BFF) Keith goes. Randall gets on campus and is the happiest we’ve ever seen him — it’s the first time he is surrounded by people who look like him. The kid is excited. On the ride home (so much driving in one day! ), Jack and Randall have a heart-to-heart in which Jack asks why Randall hesitated when introducing Jack to his friends, implying it was because Jack is white. Randall jokes that it was because he’s old, but then opens up. The way Jack felt in that moment is the way Randall feels all the time. Not exactly angry, but off-balance. Jack understands. He makes a detour to the Vietnam Veterans Memorial and explains to Randall that when he came home from Vietnam, he felt off-balance in every place he went. Randall won’t always feel that way. He also calls Randall spectacular and YOU GUYS if this is their last heart-to-heart, well, at least it’s a good one. The boys make it to the hospital in time for Jack to make us all weep with that “passing of the necklace” speech to Kevin. Randall is concerned for his brother and Jack explains that he’ll be okay, just different. He tells Randall that it’s tough with three kids — there’s always a blindspot. You’re watching one kid stand tall and you don’t see another is falling down. This time, Kevin was in his blindspot. We’re all well aware that Kevin is in the blindspot in 2017, too. He shows up at Randall’s after Deja leaves, and not long after Randall gets a call from Rebecca about Kate. Randall has a lot going on in his head, so he seems taken aback by Kevin chugging a screwdriver in his kitchen, but doesn’t do more than tell his brother to get some rest while Randall tries to call Kate. When Tess and Annie bombard their uncle — they are very upset about Deja — Kevin can’t handle it. He needs to leave, grabs his keys, and goes. As he is swerving, speeding, and driving like the drunk maniac he is, Tess pops up in the backseat. She wanted to get out of her house. Thankfully, no one gets hurt — an ambiguous car crash feels like it would be a very This Is Us way to end before winter hiatus — and instead, Kevin is arrested for a DUI while his niece watches from the car. Thanksgiving is a rough holiday for the Pearsons. • Inspired by Kate’s hopefulness, Randall and Beth want to try fostering again. Maybe it’ll be a boy, Randall teases, but he doesn’t control destiny! Well, what do you know: There is the CUTEST little boy sitting with his social worker, waiting to find a home. THAT FACE. Randall and Beth will fall for that face. • One of the greatest gifts This Is Us has given us in its short time on this earth is “Thanksgiving Dad is a hot dad,” so bless them for bringing it back this year. • Back in the Big Three baby footage, Randall takes his first steps and says his first word at the same time. Number Three has always been an overachiever. • Jack looking at his family sitting together in the living room while Cat Stevens plays. Really, I should just stay in puddle formation from now on. It would be much more convenient.